Developments over the past years in Gas Assisted Moulding or (Gas Assisted Molding to use the US spelling or Gas Injection Moulding being a common reference term) have resulted in advances in the way in which injection moulded components are manufactured. Enhanced quality, reduced cycle times and component weight reductions can be achieved by the process. To mould thermoplastic materials, they have to be heated to their melt temperature and injected into a closed metal mould. Cooling channels built into the mould act to cool the mould and in turn extract heat from the material. When cooling, the material shrinks away from the mould cavity surface. To counteract this, more plastic material is injected (packing) into the cavity to try to maintain the surface contact. At a point in the moulding cycle, the material at the gate feed point solidifies (freezes) precluding any further packing. In thick components the shrinkage of the material from the mould surface is more pronounced. Techniques have been developed whereby inert gas nitrogen is injected into the still molten plastic in the mould cavity. Acting from within the component shape, the gas inflates the component and counteracts the effects of the material shrinkage. The effect is to keep an internal pressure on the material until it solidifies and skins at the mould cavity surface. This is independent of any gate freezing. During the 'normal' injection moulding process of packing a mould cavity with plastic material, stresses are introduced into the component. Often these are along the line of flow of the packing material. In service these will result in the moulding warping and changing its dimensions. By using the gas medium, transmission of pressure throughout the moulding is more efficient and therefore less pressure is required. In addition, with the material being pressed against the mould surface by the gas until it solidifies, the moulding will have better surface definition and will be more likely to be dimensionally correct. External gas injection provides an enhanced surface definition of the component. The combined benefits of not packing a moulding are less material is used. By not having to pack the material, and in thicker components the resultant hollow core, can save as much as up to 30% on the material used. Another major benefit is the reduction in machine cycle times that can be achieved. With no molten core to solidify, the material in the mould cavity solidifies quicker thus enabling the component to be ejected sooner. Better dimensional control, and increased surface quality are major benefits of using gas injection. Sink marks caused by local thick/thin deviations in wall section can be eliminated. 1. Reduction in molded plastic weights, and therefore cost of material. 2. Reduction in molding time cycles, and therefore cost of production. 3. Reduced in-mold pressures, and therefore less wear on molds. The use of the gas as a means of transmitting pressure uniformly throughout the molding. Avoidance of plastic packing from the molding machine. Reduced in-mold pressures by up to 70%, and therefore reduced press lock forces enabling larger moldings on smaller machines. Reduced molded in stress, and therfore improved dimensional stability with no distortion. Virtually eliminates moulded-in stress and therefore distortion. reducing lock forces or machine size. thicker ribs with reduced wall thicknesses. flat PP and PE products. 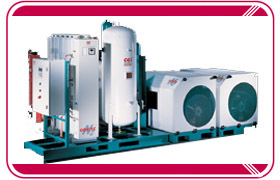 The Cinpres Gas Injection Company have developed a range of gas generation and control equipment to cover any manufacturing need. Some patented process variants are offered under licence. Most plastic injection moulded components can benefit from the use of gas assisted moulding. Applications from consumer goods to automotive parts benefit from the process. Flat panels for office equipment. Domestic appliances - e.g. fridges. Most thermoplastics can benefit from the use of gas assisted moulding including Polypropylene (PP), ABS, HIPS, Polycarbonate (PC), PPC and Nylon (including glass filled grades).